Wilmington, DE, November 06, 2018 --(PR.com)-- Just one day after the largest marathon in the world, 6AM Run announced they will be participating in the Philadelphia Marathon Expo, November 16th/17th. 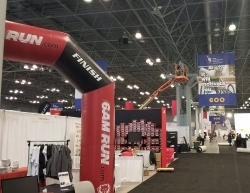 6AMRun.com did not hold back in its first major marathon in NYC. They came out "swinging for the fences," a staff member stated. Not many companies would make the largest marathon in the world their first one to try as a vendor. Yet, then again, 6AM Run doesn't do anything like others. After doing a lot at their local 5K and charities in Delaware, this was not familiar territory for the "start-up" who is not even six months old. “I would first like to thank the amazing NYRR, TCS and the entire team at the NYC Marathon. They 100% made this opportunity happen, and helped us make the absolute most of our ability to showcase to over 100K people,” Hami Mahani, 6AM Run CEO said. “Nothing we do as a company is normal. Nobody would make the NYC Marathon their debut marathon in this industry. They would use a smaller one as their training wheels,” Mahani said. 6AM Run handed out over 5000 samples, 10,000 brochures and said to have sold hundreds of bottles to both new and existing runners at the race. 6AM Run also had ten runners who are regular supplement users of theirs running the marathon wearing their shirt. They now have just announced they will be at the Philadelphia Marathon Expo in the Philadelphia Convention Center on November 16th and 17th. The Marathon itself is on the 18th. “There is no slowing us down now. We had such a great weekend, we will keep this going. As a Wilmington, DE, LLC., Philadelphia truly is our backyard, so we wouldn't miss it for the world,” Mahani said. It's important to keep in mind this company just began selling their unique cardio formulas in June. They're not even 6 months old yet. Look for them at Booth #1119, Hall F of the Philadelphia Expo Center.